Thanks Center for Food Safety for Helping Hawaii Farmers! Right now, a whole bunch of politicians and activists are packing a conference room to dictate laws that will be placed against farmers under the disguise of “protecting keiki, kupuna, and others.” That’s the intent of the expressed law but the real intent is just targeting agriculture irregardless of the size of the farm. Unlike activists, the farmers don’t have the luxury cruising around the Capitol and socializing with other activists while waiting to give testimony. My dad and brother have deliveries to make for their customers who keep them farming. I’d be there right with them except I have an unvaccinated newborn to care for. Setting aside 3 hours to defend themselves means unnecessary inconveniencing of stores and waiting customers. In lieu of testifying in person, my dad and brother sent in their thoughts to the legislators. 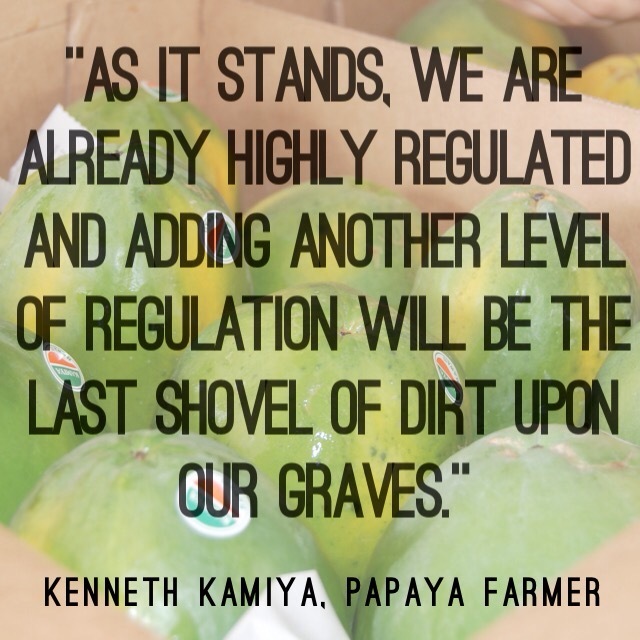 My name is Kenneth Kamiya and I am a papaya farmer on Oahu with over 40 years of experience in growing papayas. I strongly oppose HB 1514. This bill as written is anti-farming. It purports to protect children, kupuna, and the general citizenry but in actuality it hurts everyone. We talk about food sustainability in Hawaii, yet this bill will discourage farming all together. There is talk of a dock strike on the west coast and food may become in short supply, and yet we are trying to discourage farmers from producing the food that we eat. Pesticides are tools for the farmer to utilize in agriculture. A mechanic without tool is not a mechanic. A farmer without the proper tools cannot be a farmer in Hawaii. As it stands, we are already highly regulated and another level of regulation will be the last shovel of dirt on our graves. My name is Michael Kamiya and I am a 3rd Generation Papaya Farmer. My grandfather started papaya farming in the 1940’s and my father continued to grow the farm and produce the Kamiya Papaya which is sold throughout the island. As a new farmer just learning the business and slated to take over in the next few years, I strongly opposed HB 1514. This is an attack on local small agriculture. Though it may not be written for small farms, it will still affect us. In fact, it DIRECTLY affects us because our farm borders the Brigham Young Hawaii Campus. We have 6 acres that are bordering the mens and womens dormitories along our farm. If this law were to come into effect, we would lose that prime agricultural land that our farm has cultivated for over 25 years. To add to that, in those 25 years, we have not had a single complaint from any students, staff or faculty member from the campus. The fields that border the dormitories have infrastructure that we have personally invested in, they include roads, irrigation, soil amendments and swales to prevent flooding or run off. If we were not allowed to continue farming in those fields, it would severely impact our production and ultimately our business. Another reason I oppose this bill is because it contains redundancy from the Worker Protection Standards. As a certified and licensed pesticide applicator in the State of Hawaii, we already comply with much of the requirements listed in the proposed bill. Postings, record keeping and disclosure are all required and thoroughly reviewed with the USDA Food Safety Audit that we must comply with every year in order to sell and market our products. The exemption for the Pest and Termite Companies is very discriminatory towards farmers. They spray and use far more dangerous chemicals than we as farmers ever use. If we are to regulate and manage pesticide usage in Hawaii, it should be for everyone including businesses, golf courses, schools, government, even homeowners, not just farmers. Lastly, as a new and hopeful farmer looking to the future, instead of making laws to stifle farmers, we should work together as a community to promote proper pesticide usage. Laws are good when its intentions are fulfilled and this bill does not do due diligence to the perceived need for legislation. If we as a community and the political leaders truly want to protect people, then apply the regulations across the board for each and every user who potentially can harm others with misuse. That includes the state and county agencies who use the same substances. It’s also disturbing to see that this law also subjects farms to lawsuits but does of clearly spell out what the course of action or processes that will be applied. It fuels more attacks and places more uncertainty as to what’s the next thing they are going to burden farms with. The worst issue about this proposed law is that it continually subjects farmers to more attacks based in misinformation. The accusations that farmers “douse their crops in toxins” and “spray people” or “poison the aina” will only be perpetuated given the language of the bill as written. Is that going to encourage others to farm or even want to continue farming? Furthermore, these activists preach doing what is pono (righteous) and can’t even walk the talk. So Rep. Lee and Rep. Lowen as well as other committee members, really consider all the consequences of any law you are proposing. The backers of this bill, the Center for Food Safety, stated that they are here to grow the local food movement but in reality are out to break it. If we as a state want to have more local foods, we’d better support the people, big or small, that make this happen. Hawaii Seed’s Walter Ritte expressed in his Star Advertiser commentary yesterday that it’s big corporations that is blocking farming. Sorry, but it’s not them. It’s you and all of your associations from Vandana Shiva, Babes Against Biotech’s Naomi Carmona, Dr. Hector Valenzuela, and SHAKA’s Lorrin Pang, armchair farmers, and Center for Food Safety’s Ashley Lukens who are killing people’s desire to continue their tireless work. Pointing fingers and making false accusations against the 1.5% that feed you isn’t inspiring anyone to grow Hawaii. Keep it up activists and Hawaii can be proud to say that ALL of our food will be imported and there will be no need to keep the country country anymore. You’ll appreciate it more if that dock strike hits and we get to thank the activists for their accomplishments!